Description: Summit Bank is a business categorized under banks, which is part of the larger category national commercial banks. 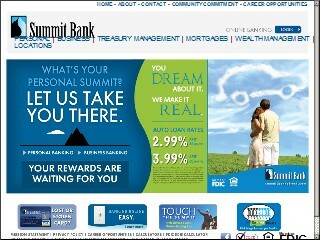 Summit Bank is located at the address 401 Section Line Trail, Hot Springs, AR 71913 in Hot Springs, Arkansas 71913-6831. The President is Tom French who can be contacted at (501)525-6700. Location & access map for "Summit Bank"